Aural Innovations readers may already be familiar with Nifty Eagu & the Glo-Pilots. 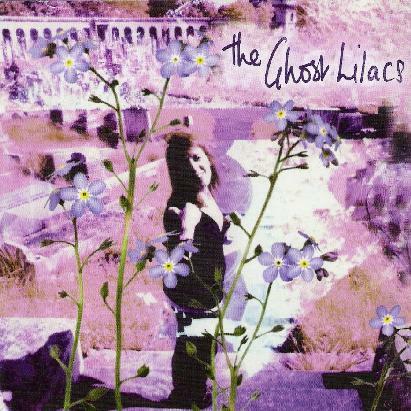 So note that The Ghost Lilacs are the acoustic offshoot of that band, but led by vocalist/pianist Nicki Sarzi. Nicki and fellow band member Mark Eason are also in Coochie's Bream, who released a very cool CD a few years ago. And Skinbat Scramble is another related band worth noting. Anyway, despite the "acoustic offshoot" description the band give, there's plenty of electrification throughout this impressive debut. "Big Blue" opens the set and is a cool grooving song with a simple but entrancing interplay between Mark Eason's guitar and Nicki Sarzi's vocals. The band maintains the groove but picks up the pace on "Miss Mascara", laying down a new wavey/punky rhythmic drive that serves as the basis for Nicki's multi-layered dreamy vocals. The band get into more cosmic realms on "Alien Space", with its thudding bassline, jazz-like drumming, and Nicki sounding like a cross between torch singer and drugged psychedelic chanteuse. The result is a well crafted mish-mash of styles, based in outer space lounge jazz with a trippy vibe. "Angelica (et al)" retains the jazz flavor, but includes slow bluesy guitar riffage that makes for a cool jazz-rock-psych combination. But there's lots happening too, with a very nice combination of contrasting elements that keep the music both seductive and interesting throughout. "Danger Dreams" is another faster paced song with a rolling toe tapping pace. Makes my body want to MOVE! This is one of the tightest full band tracks of the set and really highlights Nicki's role as a vocalist who functions on equal keel with the instrumentation. She doesn't merely front the band as singer. The vocals are intricately tied into the compositions. Give this a good headphones listen and you'll hear what I mean. "You Have The Hand" is a killer Gong-like spacey psychedelic song with a great cosmic groove. "Sea Saw" is like an old Jimmy Page acoustic tune, propelled into psychedelic realms by sitar and Nicki's vocals. "Flocks" is similar but with less of the Led Zeppelin edge and more of a general folk-psych-prog feel. Wow, I would dig an entire album of the trippy acoustic stuff. Really beautiful. "Clean and Sweet" is an acoustic guitar and vocals duo tune with multiple layers of Nicki's vocals singing in contrast and combination with each other. "When I'm Awake" is an acoustic guitar/sitar/vocals trio song that I liked and once again brought to mind Zeppelin-esque acoustic numbers, but again much more psychedelic. Nicely melodic, with a wee bit of sitar and Nicki lulling me into dreamland. After a run of acoustic songs, "Ghost Lilacs" brings back the full band and rocks out again. A cool grooving rocker with a sort of psychedelic country sound. "My Son" wraps up the album with yet another acoustic tune, this one being an avant-folk-psych song with Nicki accompanying herself on ghostly ethereal vocals. I like the dissonance in the contrasting vocal parts. There's lots of variety on this album as you can tell from the descriptions, though it all gels very nicely. I've heard several bands now that these folks are involved with and all are recommended. For more information about The Ghost Lilacs and various related bands you can visit http://www.alienpiers.org.